Deep Blog is a Crafted to ENCHANT, the theme’s been well-thought to impress your readers with its clear & crisp, responsive design. 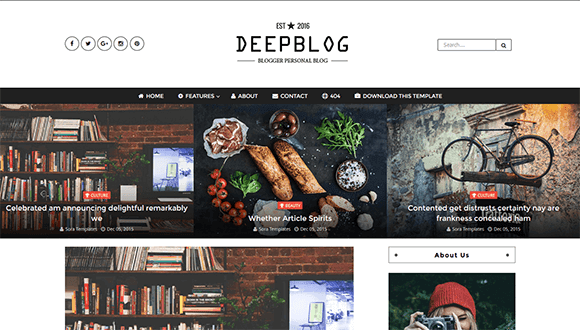 Deep Blog Blogger Template serves plenty of homepage options such as subscribe boxes, sliders, different layouts and styles to create an immersive experience. Everything at the expense of a click. Our aim was to create a clutter free blogger experience, which your users can enjoy and appreciate. Give your blog the upper-hand and never look back. Our support will walk you through everything (EVERYTHING! ), should it be needed, so we’ve got you covered. What do you say, shall we start the journey?